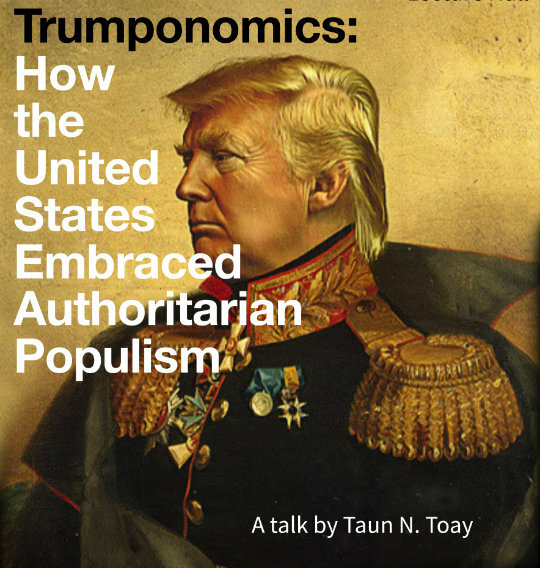 This an article that covers the main themes of Taun N. Toay’s “Trumponomics” Lecture which includes his insights on polling, the working class, the appeal of Trump, the economic effect of his policies and his view on the resistance. Then the article continues with my personal experience of an anti-Trump protest that I attended and my reflections about what this type of dissent means. On the 2nd of February, in the times of pre-judicial halts of Donald Trump’s Muslim Ban Executive Order, the students and faculty of Bard College Berlin had the pleasure (and discomfort) of listening to Taun N. Toay’s lecture “Trumponomics: How the United States Accepted Authoritarian Populism”. Taun N. Toay is the Annandale-based Managing Director of Bard College Berlin and of the Levy Economics Institute at Bard College. Armed with his economic background, Toay aimed to give a crowd of concerned U.S. and non-U.S. citizens an economics-centered explanation of this political phenomenon that most of us mention at least once a day now, because, honestly, how can we not? Toay began his presentation by elaborating on why the polls were wrong – something that was seen as perhaps the most baffling failure of this election cycle. Many polls predicted Hillary winning by small margins, and some, such as the Huffington Post poll, predicted ridiculous victories for the Democratic nominee. This was largely the results of poor survey design and weak statistical usage. One of the faults that Toay pointed to was in the questions the polls asked. Few polls ascertained whether a voter actually planned on voting in November, in turn underestimating the number of people who would physically make the effort to vote for Hillary. Another pollster oversight that Toay pointed to was the fact that people underreport inclination toward an ‘extreme’ candidate. In other words, saying that one would vote for Trump was so stigmatized that it was likely that person would remain a part of the “silent majority” – a rumored idea present during the election that not many people were willing to buy into, and that, statistically speaking, does not exist, since Hillary won the popular vote – but the reality is that the ‘extreme’ candidate is now sitting in the Oval Office signing Executive Orders on a whim. Aside from the lessons we need to learn from this election’s polling, Toay mostly focused on the root causes of the rise of Trump’s brand of Authoritarian Populism, while keeping in mind our lack of anticipation for it. Toay first pointed to the fact that Trump’s political strategy is not as original or as new as many of us believe. In fact, the Reagan/Bush 1980 campaign slogan was “Let’s Make America Great Again”. More importantly than its catchy slogan, it was Reagan’s economic policies that laid the groundwork for the immense income inequality in the US today. Trickle-down economics and neoliberal policies that were to release businesses from “the tyranny of Washington” promised wealth for everyone, yet provided benefits primarily for the very wealthy, leaving a lot of people behind, including an ever shrinking middle class. Through this historical economic analysis, Toay argued that Trump’s presidency is a result of economic inequality rather than the bigoted views that a lot of his supporters hold. After struggling to recover from the 2008 crisis, too many people felt so economically insecure and mistrustful of the U.S. government that they got swept up in anti-establishment, right-wing politics and viewed Trump’s election as a way to send a serious message to a government that would be forced to listen to them. While racism and sexism were clearly on strong display in the election, Trump fared surprising well with certain minorities and white women. The fact that so many lower-income citizens voted for a billionaire who is as far away from being outside the establishment as one can be just proves how much the Democratic Party both lacked a class conscious platform and was incredibly out of touch with the worries of everyday Americans – to the point where it couldn’t win an election against such an outrageous candidate as Trump. In other words, Hillary should have won the popular vote by ten million, not two, but didn’t because she was unrelatable to the average American; if the Democratic Party does not change its approach soon, Donald could be just one of many Trumps. But it seems that, in their discontent at the status quo, voters overlooked the long run consequences of Trump’s proposed policies. Through some promises to benefit the working class in the short-run – such as affordable higher education, child care subsidies and controlled health care costs – these policies require higher government expenditures. When paired with right-wing economics demanding low taxes on the rich, you end up with a smaller budget to pay for them. In the long run, you will not have enough money to sustain such social programs, which would necessitate an increased borrowing of money. This, in turn, would sky-rocket the national debt, which could very likely lead to both a national and international economic crisis that certainly wouldn’t benefit the working class: Trump, sadly, seems the wrong way to fight the class war. Continuing with the theme of economics, Toay moved to Trump’s immigration ban – which has been temporarily halted and will hopefully be permanently terminated. From a humanitarian perspective, it is obvious why we would be against such an overtly racist action that would have banned even Green Card holders from exercising their legal permanent residence; thus, Toay did not spend much time discussing this aspect of the issue. Rather, he focused on how the immigration ban is simply bad economics. Immigrants do not pose such an economic burden in terms of healthcare and welfare benefits, as conservatives often like to claim, but rather they bring a higher net benefit than their citizenship-possessing counterparts. Immigrants constitute only 12% of the U.S. population, but make up 17% of the workforce; 40% of Fortune 500 companies were founded by immigrants or their children. If President Trump were to make the U.S. an inhospitable place for immigrants, it would not only be a humanitarian catastrophe, but potentially an economic one too.